Jansport Driver 8 backpack most of us will want or need a good quality backpack at some point, and JanSport is a brand you can trust. The JanSport Driver 8 backpack is a popular choice. This model, which is made from 600 denier polyester, features a front stash pocket, padded grab handle and controlled motion, as well as a retractable handle and padded sleeve for your laptop. The front utility pocket is handy for your essentials and the shoulder straps convert this wheeled piece of luggage into a backpack which offers two large compartments. 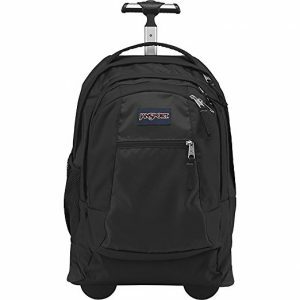 The JanSport Driver 8 wheeled backpack features large wheels which glide easily. Wheels are really handy if you want to pull your backpack instead of carrying it. The wheels have stability control and traction, so even if you have a lot in the bag, you can pull it with ease. 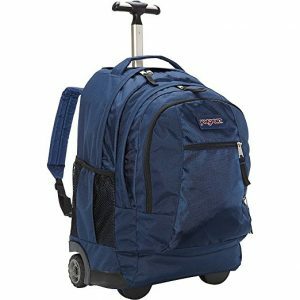 The JanSport rolling backpack is a great choice if you are traveling on business and you can use it as your carry on luggage in a plane. It is also the right size for an overnight stop since you can fit a change of clothes in there, as well as basic toiletries, your laptop and any paperwork you might need. The handle on the JanSport driver 8 is really good. You simply press the button and down it goes without any resistance. If your existing wheeled backpack has one of those handles you have to force down, then you will love the easy button version. Whether you want a rolling backpack for school, college or business, you cannot go wrong with JanSport. This is a durable, sturdy backpack, and the hippy design is a lot of fun, whether you are buying this for weekend trips, as carryon luggage or using as a school bag. There is a telescopic, 3-stage, molded rubber handle which retracts easily, tuck-away straps and skate wheels. This pack is built to last, and even though JanSport bags can work out a little more expensive than other brands, there is a reason for this. This bag will serve you for years. You can wear it like a backpack or put it on the floor and pull out the handle for wheeling it along. Wheeled backpacks are handy for everyone, and you can give your back a rest by pulling your luggage instead of carrying it. Perhaps it would make a great school bag for one of your kids. Whatever your age or size, a wheeled JanSport backpack is a good choice. A medium-size backpack makes a good bag for school, and this can be pulled along easily by a child of any age. Wheeled backpacks are also great for traveling because they come in different sizes so they could be your carry-on baggage if you are traveling light, or an accompaniment to your checked baggage if you simply want to keep your laptop and a few personal effects with you. If you pack light, you could even use this backpack for a two or three-day trip, easily fitting in everything you will need. The pockets will keep your tickets and passport safe, and the padded laptop compartment means no harm will come to it. 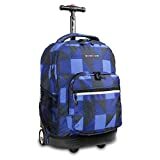 Convert your rolling backpack into a regular backpack using the comfortable padded straps or wheel it along if you want to carry a lot with you that day. The different compartments in the backpack hold various items, and the wheel handle is easy to use – it just pops out and back. JanSport backpacks are constructed in style and also offer all the features that you could need, giving you mobility and convenience. Like the rest of the JanSport range, this JanSport Driver 8 backpack is very well made. The fully padded back panel has to cushion for comfort, and the front utility pocket has an organizer in it to keep all your essential items to hand. The padded sleeve will fit a laptop up to 15 inches. The 2 main compartments are roomy, and the tuck-away shoulder straps mean you can convert this bag into a backpack. The bag has retractable wheels, and it comes in purple or pink. 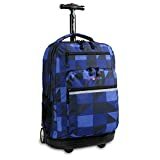 Rolling backpacks like this one are better for the back than carrying items over one shoulder, and it is easy to pull along the hallway, picking it up by the straps when you are climbing stairs. It is hard to go wrong with JanSport because all their models are well designed and top quality. This backpack is made by JanSport, which means it is sturdy and durable. Featuring skid rails for extra protection and tuck-away straps, this makes a great gym bag, travel bag or school bag. It is larger than the regular Superbreak backpack, measuring 19 x 13 x 9&quot; inches, and it weighs 6 pounds empty, but as you would imagine it does carry a lot. Also, the weight does not matter because this is a wheeled backpack and it can be pulled along instead of having to be carried. There is plenty of storage room in here, so you can easily fit in everything you need. The handle is long so even if you are tall you should find it comfortable to use. This is a good choice if you are looking for something durable which is going to last. If you are tired of having to change your backpack every year, then try the JanSport Wheeled Superbreak Backpack, because it will last for a long time. JanSport bags always get high reviews, and this is a popular model to choose. 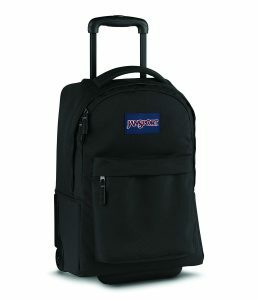 This wheeled backpack is large enough to hold notebooks with up to a 15-inch screen, as well as all your other luggage. There is a side water bottle pocket, a zippered pocket on the front, and a big front drawbridge compartment. You get a quick-grab handle, tuck-away shoulder straps, and a padded back. The wheels function well too, and they are large and side-mounted and offer stability control and traction, so you have full control of the bag. The handle is easy to put down too, so if you need to climb stairs you just have to press the button, and the handle goes down cleanly and simply. This bag is built to last, with its 600-denier polyester construction. You can use it as a daypack or school backpack. It has a big main compartment as well as smaller ones you can use. The shoulder straps are padded and comfortable. This is a great one for school, because it comfortably holds several textbooks, spiral notebooks, a binder, cell phone, calculator, paperback books, a bag lunch, pencil case, and more. This bag comes with a lifetime warranty and you can choose the Downtown Brown Lad Plaid or another color or design. It can be difficult to find classic American styled backpacks these days instead of all the outlandish offerings out there, but JanSport offers something for everyone. This bag looks cool and is really durable. Many reviewers have happily been using their JanSport bags for over a decade. Many people fly frequently, and even if you do not, it is worth having a good backpack which can double up as carryon baggage. Most of the JanSport bags are excellent for this. They are durable and sturdy enough to carry everything you will need in the cabin. Also, a lot of them will feature various zippered pockets so you can quickly and easily find that lip balm or spare battery for your mp3 player without blocking the aisle for 10 minutes searching through the main compartment. If you are just going away for a day or two, you might like to skip paying to check in a bag and only travel with your carryon, in which case you will want something large enough for the job. A backpack on wheels is easier to maneuver through the airport and of course pulling it is easier on your back, although if you do want to carry it these bags also offer straps for that purpose. However you might wish to forgo the added hardware (wheels) to save on weight, since part of the maximum cabin weight will already be the backpack itself and the more the bag in question weighs the less you are going to be able to put in there. Rolling luggage can weigh up to twice what non-rolling luggage weighs. Another thing to consider is the dimensions of your carryon luggage. If the bag is larger than their airline allows you will have to check it in anyway, so plan your trip in advance and make sure you know the maximum allowed weight and dimensions, then you can choose the best carryon baggage to take and work out whether or not to take check-in luggage too. Remember a backpack is softer than a rigid cabin case, so you will probably be able to squeeze it into the luggage template if it is near enough the size, perhaps pulling out a sweater to reduce its dimensions first. The small rigid cases are often used only for air travel, while backpacks tend to be more versatile, so you can get the perfect JanSport backpack to fly with, plus use it for hiking, city trips, going to the gym and whatever else you need. JanSport certainly make durable, high quality backpacks, so you can do all these activities and more, and your backpack will be your best friend during the trip, keeping your possessions safe inside. So when deciding which JanSport backpack is best, consider how often you travel or take trips, as well as what size and type of backpack will serve you the best. JanSport backpacks are always very much in demand because they have a reputation for very good quality. There are backpacks for everyone, so whether you are just looking for something to take to school or college, planning a hiking expedition, or needing something waterproof, durable and up to the challenge of snow sports or extreme sports, then JanSport backpacks would be ideal. A lot of professional sportsmen choose this brand, so you will certainly not be disappointed with the quality you get. 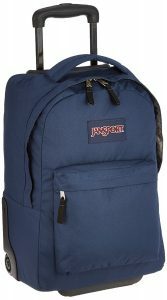 The top selling JanSport backpacks are the simple ones which you can use for a day trip or take to school or college. These are loved all over the United States, Canada, Europe and in other places too, and the brand has a global appeal. Not everybody needs to lash straps for snowboards or loops to hold ice picks, but if you do, then you can also get backpacks like that. There is something for every need, no matter what your age, gender or requirements are. 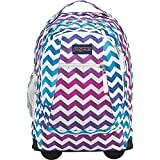 JanSport backpacks come in all kinds of colors and designs so you should have an idea what type and size you want to get, then you can think about colors. A JanSport backpacks are going to last for years and years so make sure you pick out something you like. You can always get more than one in you want a smaller backpack for day trips and a larger one for weekend camping or hiking trips.